Not to be confused with Ferrara Candy Company, an originally-unrelated American company that Ferrero acquired in 2017. Ferrero SpA (Italian pronunciation: [ferˈrɛːro]) is an Italian manufacturer of branded chocolate and confectionery products and it is the second biggest chocolate producer and confectionery company in the world. It was founded in 1946 in Alba, Piedmont, Italy, by Pietro Ferrero, a confectioner and small-time pastry maker who laid the groundwork for Nutella and famously added hazelnut to save money on chocolate. The company saw a period of tremendous growth and success under Pietro's son Michele Ferrero, who in turn handed over the daily operations to his sons. His son Pietro (the founder's grandson), who oversaw global business, died on April 18, 2011, in a cycling accident in South Africa at the age of 47. The Ferrero Group worldwide – now headed by CEO Giovanni Ferrero – includes 38 trading companies, 18 factories, approximately 40,000 employees and produces around 365,000 tonnes of Nutella each year. Ferrero International SA's headquarters is in Luxembourg. Ferrero SpA is a private company owned by the Ferrero family and has been described as "one of the world's most secretive firms". 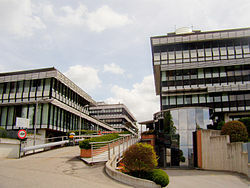 Reputation Institute's 2009 survey ranks Ferrero as the most reputable company in the world. The company's financial results for the fiscal year ending August 31, 2016 showed consolidated sales growth of 8.2% from the previous fiscal year. In 1946, Pietro Ferrero invented a cream of hazelnuts and cocoa, derived from gianduja and called it Pasta Gianduja. The initial product came in solid loaves wrapped in aluminium foil, which had to be sliced with a knife, and was succeeded by a spreadable version Supercrema. With assistance from his brother Giovanni Ferrero, Pietro Ferrero created his new company to produce and market the initial product. Following his work, Pietro was succeeded by his son Michele Ferrero as chief executive. Michele and his wife Maria Franca relaunched his father's recipe as Nutella, which was first sold in 1964. After World War II, they opened production sites and offices abroad and Nutella eventually became the world's leading chocolate-nut spread brand. Ferrero is the world's largest consumer of hazelnuts, buying up 25% of global production in 2014. The company is currently run by Giovanni Ferrero, grandson of Pietro and son to Michele Ferrero. The company places great emphasis on secrecy, reportedly to guard against industrial espionage. It has never held a press conference and does not allow media visits to its plants. Ferrero's products are made with machines designed by an in-house engineering department. In 2014, Ferrero acquired Oltan Group, the largest hazelnut supplier in the world. Ferrero acquired the British chocolate retailer Thorntons in June 2015 for £112 million. In 2016, Ferrero SpA acquired Belgian biscuit brands Delacre and DeliChoc from United Biscuits. In March 2017, Ferrero SpA bought the chocolate maker Fannie May from 1-800-Flowers.com. The deal closed on May 30, 2017 and Ferrero paid $115 million. Ferrero mentioned that they hope to expand Fannie May as a whole. They want to provide Fannie May locations across the nation, not just in Chicago. On 30 March 2017, it was announced that Lapo Civiletti will be the first non-family CEO in the history of the company and will take up the role from 1 September, while Giovanni Ferrero will become the executive chairman focusing on long-term strategy. In October 2017, Ferrero purchased the Ferrara Candy Company. On 16 January 2018, it was reported that Ferrero was purchasing Nestlé's American confectionery business for $2.8 billion. The deal does not affect Nestlé's confectionery business elsewhere, and does not include Kit Kat or the Toll House baking line. The acquisition was completed in March 2018. On 1 April 2019, Ferrero further expanded its US business when it bought a collection of business previously owned by the Kellogg Company. Included in the deal are Kellogg's cookie, fruit and fruit-flavoured snack, ice cream cone and pie crust businesses. These involve famous brands such as Keebler, Famous Amos, Mother's, Murray's and Little Brownie Bakers - one of the producers of the cookies for the Girl Scouts of the USA - as well as six owned food manufacturing facilities in Allyn, Washington; Augusta, Georgia; Florence and Louisville, Kentucky; two plants in Chicago, Illinois; as well as a leased manufacturing facility in Baltimore, Maryland. Ferrero is paying the Kellogg Company $1.3 billion for the deal. Ferrero produces several lines of confectionery goods under various brand names, as well as the chocolate-hazelnut spread, Nutella. The company has produced Nutella since 1964. The production of Nutella uses one-quarter of the world's annual hazelnut supply. Ferrero's Kinder brand line of chocolate products include Kinder Surprise, Kinder Joy, Kinder Chocolate, Kinder Happy Hippo, Kinder Maxi, Kinder Duplo, Kinder Country, Kinder Délice, and Kinder Bueno. The company also produces Tic Tac candy, available in mint, cinnamon, and fruit flavors, along with sugar free versions. Other Ferrero products include Raffaello, Giotto, Fiesta Ferrero, Hanuta chocolate hazelnut-filled wafers and Gran Soleil frozen desserts, which won the company an innovation award in March 2011. Ferrero has been producing Thorntons products since acquiring the company in 2015. In 1983, the Ferrero Foundation was established in Alba, Piedmont at the wish of Michele Ferrero. The foundation promotes activities in the areas of art, science, history and literature by organizing conventions, conferences, seminars and exhibitions. It also offers health and social assistance to ex-employees of the group for at least 25 years. ^ Ilan Brat; Jeffrey McCracken; Dana Cimilluca (November 9, 2009). "Hershey Plots Cadbury Bid". The Wall Street Journal. [Ferrero] is known for the secrecy with which it guards its chocolate recipes and its management decisions. ^ "Italy's richest man, Michele Ferrero, dies after illness". dw.com. 14 February 2015. Retrieved 16 January 2016. ^ "Michele Ferrero, Nutella owner and Italy's richest man, dies aged 89". afp.com. 15 February 2015. Archived from the original on 20 February 2015. Retrieved 16 January 2016. ^ a b c Hooper, John (2 July 2010). "Italy's meltdown over EU Nutella ban that never was". The Guardian. Retrieved 3 July 2010. ^ Klaus Kneale (May 6, 2009). "World's Most Reputable Companies: The Rankings". Forbes. ^ "Ferrero, fatturato a 10,3 mld (+8,2%). L'azienda: esercizio "eccezionale"" (in Italian). ItaliaOggi. 28 March 2017. Retrieved 28 March 2017. ^ a b c Mitzman, Dany (18 May 2014). "Nutella: How the world went nuts for a hazelnut spread". BBC News. Retrieved 16 January 2016. ^ a b c "Ferrero - A family history". Ferrero. Retrieved 16 January 2016. ^ Oliver Nieberg (17 July 2014). "Ferrero acquires hazelnut supplier Oltan". Confectionary News. Retrieved 11 December 2015. ^ a b Esha Vaish and Giancarlo Navach London (23 June 2015). "Ferrero Agrees to Acquire UK's Thorntons". The Star. Archived from the original on 20 February 2016. Retrieved 10 December 2015. The Italian firm behind Ferrero Rocher chocolates and Nutella spread has agreed to buy British chocolate retailer Thorntons for £112 million (R2.1 billion), striking a rare deal to expand in Europe's biggest confectionery market. ^ a b Farrell, Sean (22 June 2015). "Thorntons bought by Ferrero for £112m". The Guardian. Retrieved 22 June 2015. ^ Atherton, Matt. "Ferrero completes deal for United Biscuits' Delacre". Food Manufacture. William Reed. Retrieved 6 September 2018. ^ "Ferrero to purchase Fannie May Confections Brands for $115 million". Retrieved 2017-05-08. ^ "Ferrero International to acquire Fannie May Confections". Retrieved 2017-05-08. ^ Channick, Robert. "Italian maker of Nutella buys Fannie May". chicagotribune.com. Retrieved 2017-05-08. ^ Samantha Bomkamp. "Ferrara Candy to be acquired by Nutella maker Ferrero". Chicago Tribune. Retrieved 17 November 2017. ^ Gretler, Corinne. "Nutella Maker to Pay $2.8 Billion for Nestle U.S. Candy Unit". Bloomberg. Retrieved 16 January 2018. ^ "Ferrero Completes Acquisition of Nestlé USA's Confectionary Business". Business Wire. Retrieved 7 May 2018. ^ Reddy, Arjun. "Kellogg has agreed to sell its Keebler and Famous Amos businesses to Ferrero for $1.3 billion". Business Insider. Insider Inc. Retrieved 2 April 2019. ^ Yu, Douglas. "Ferrero Enters U.S. Snack Aisle With $1.3 Billion Acquisition Of Kellogg's Brands". Forbes. Forbes Media LLC. Retrieved 2 April 2019. ^ Annalisa Merelli (15 February 2015). "Goodbye to Michele Ferrero, the man who gave us Nutella". Quartz. Retrieved 10 December 2015. ^ Dan Charles (16 September 2014). "Thanks To Nutella, The World Needs More Hazelnuts". NPR. Retrieved 11 December 2015. ^ a b c d Nick Montano (3 March 2015). "Michele Ferrero, World's Richest Candyman And Creator Of Nutella, Dies At 89". Vending Times. Retrieved 10 December 2015. ^ "Products - Timeline". ferrero-kuesschen.de (in German). Retrieved 5 April 2017. ^ "Christmas profit preview: ring in holiday profits by stocking a range of new items and traditional favorites: part 2". Professional Candy Buyer. 1 May 2007. Archived from the original on 20 February 2016. Retrieved 10 December 2015. Ferrero also introduces Prestige Assortment, a selection of Rocher, Rondnoir and Garden Coco. ^ "America's choke hold on Kinder Surprise". Winnipeg Free Press. 29 January 2011. Archived from the original on 20 February 2016. Retrieved 10 December 2015. It's a newly arrived clutch of Kinder Surprise milk-chocolate eggs, each one with a tiny toy or puzzle or doll hidden at its core, inside a little yellow plastic cask. ^ a b Ajita Shashidhar (30 March 2014). "Unwrapped ; How Italian Confectionery Giant Ferrero Created a Market for Premium Chocolate in India". Business Today. Archived from the original on 20 February 2016. Retrieved 10 December 2015. The company rolled out Rocher chocolates nationwide in 2007 and followed this up with Kinder Joy, an egg-shaped chocolate which comes with a toy for children, and Tic Tac in 2009. ^ a b "Ferrero unveils push for Kinder Chocolate bar". Precision Marketing. 14 February 2003. Archived from the original on 20 February 2016. Retrieved 10 December 2015. Ferrero is embarking on a major data capture campaign to launch its latest import, Kinder Chocolate, by launching a Valentine's Day-themed initiative. The mini chocolate bars, aimed at six- to 11-year-olds and their mothers, are the most recent product to hit the market, following the best-selling Kinder Bueno and the slightly larger Kinder Maxi. ^ "Ferrero UK is launching Happy Hippo Cocoa Cream". Marketing Week. 6 April 2006. Archived from the original on 20 February 2016. Retrieved 10 December 2015. Kinder Happy Hippo was originally launched in the UK at the start of 2004 (MW December 11, 2003), and the new variant was launched in February. ^ "Ferrero Duplo Whole Hazelnuts". LSA Commerce & Consommation (in French). Retrieved 10 December 2015. ^ Aurelie Corbin (20 November 2015). "7 RECETTES POUR DES BARRES CHOCOLATÉES MAISON". Cosmopolitan France (in French). Retrieved 10 December 2015. ^ "Kinder Delice". LSA Commerce & Consommation (in French). Retrieved 10 December 2015. ^ "Ferrero's Kinder Bueno". Marketing Week. 4 April 2002. Archived from the original on 20 February 2016. Retrieved 10 December 2015. WCRS has created a [pounds sterling]2.3m TV campaign for Ferrero's Kinder Bueno brand. ^ Lyn White (6 April 2004). "Italy's favourite heads down under". Australasian Business Intelligence. Archived from the original on 20 February 2016. Retrieved 10 December 2015. Kinder Bueno was launched in Italy in 1990 and is now sold in more than 20 countries. ^ "Ferrero Rolls out New Flavor for Tic Tac Mints Brand". Mass Market Retailers. 23 March 2015. Archived from the original on 20 February 2016. Retrieved 10 December 2015. Spearmint Mix TicTac mints is joining the TicTac brand's portfolio of mint flavors, which includes Freshmints, Powermint and Wintergreen Tic Tac mints. ^ "Ferrero upsizes Tic Tac mints". Professional Candy Buyer. 1 November 2003. Archived from the original on 20 February 2016. Retrieved 10 December 2015. The packaging for Tic Tac mints, which come in fresh mint, orange, spearmint, cinnamon, wintergreen and lime, will remain the same. ^ "Mints: Paying the price of success; With hundreds of new items entering the mint market in recent years, could market saturation be far behind?". Professional Candy Buyer. 1 November 2001. Archived from the original on 20 February 2016. Retrieved 10 December 2015. In its 30th year in the marketplace, Tic Tac is available in Fresh Mint, orange, cinnamon, wintergreen and spearmint varieties. ^ Christian Roder (5 February 2014). "Criticism of Nutella: Candy with addictive". Westdeutsche Zeitung (in German). Retrieved 11 December 2015. ^ "Soremartec SA Receives Approval for Trademark FERRERO Gran Soleil". Indian Trademark News. 3 February 2014. Soremartec SA of Arlon, Belgium received approval from Office of The Trade Marks Registry on the trademark FERRERO Gran Soleil. ^ "Ferrero Gran Soleil receives the "Excellence in Innovation" Award". Ferrero. Retrieved 2012-03-21. ^ "Ferrero - Social Responsibility: Social activities - the Ferrero Foundation". Ferrero. Retrieved 16 January 2016. Wikimedia Commons has media related to Ferrero.